We realize you may feel that market research monopolizes your time and is a menial activity that won’t move the needle for your company. That’s why you may be putting it off or trying to schedule it in at your convenience (which never comes). But this isn’t true (not even slightly). While market research takes some time and dedication to execute, it will SAVE you the time and money you would have wasted creating subpar products, advertising to the wrong target, and failing to meet your customers’ needs (which flatlines customer retention). Additionally, in a study of professional service firms, the companies that conducted frequent systematic, structured research on their target segments grew 27.9% faster than the companies that did not perform any research. …you can’t afford NOT to do market research. Without it, you are fighting an uphill battle that will get steeper and steeper as your business grows (if it even does). We also realize that if market research is new to you, it can feel daunting. Where do you start? How do you do it right? That’s why we are here. To help you sort it out, we will dive into some market research details below. As always, if you need any additional assistance, we are here to help. Market research typically falls into 2 categories: qualitative and quantitative. Qualitative research is an unstructured form of data that makes use of subjective opinions and observations. It primarily focuses on people’s feelings, perceptions, and observations about your brand and products and gives you an idea as to why they make brand choices. Qualitative research methods typically include focus groups and interviews. 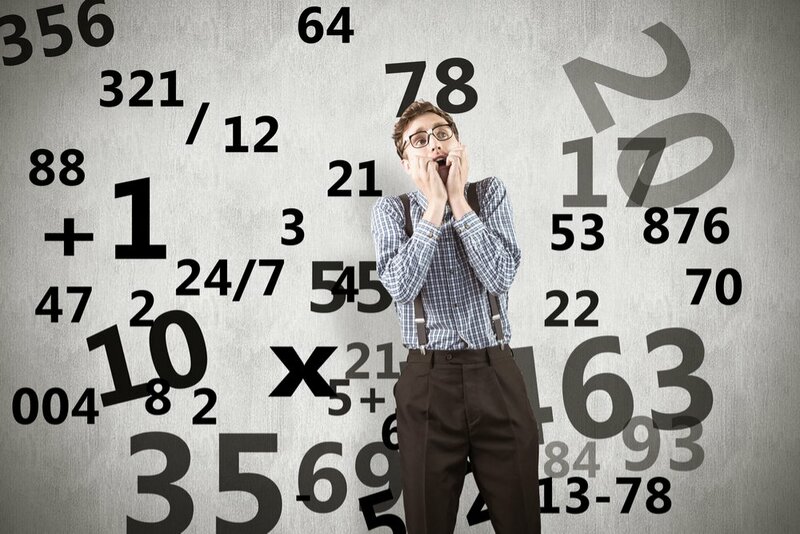 Quantitative research is exactly as its name suggests; it’s data that can be quantified. Think numbers, spreadsheets, analytics, and data you would gather from a survey. Are You a Poet or a Quant? People who conduct market research can be classified as either poets or quants. Which one are you? People who focus on consumer behavior and emotion more than numbers and statistics are often called poets. When we relate this to marketing strategy, these people would rather talk to every consumer and avoid looking at the hard numbers. Quants are just the opposite. They like to study the numbers, do statistical analysis, and bury themselves in spreadsheets. But, they never get involved in focus groups nor understand human behavior and what really makes consumers tick. Successful organizations need BOTH quantitative and qualitative research. One is not better than the other. Best results dictate that you marry the 2 to better understand your consumers and competition and get the most out of your marketing strategy. In this article, we will discuss both types of research and how you can combine the 2 to form a rock-solid market research strategy. Let’s dive into some qualitative and quantitative research modalities and go over the pros and cons of each. The best qualitative research focuses on gleaning business-growing insights to expand, improve, and grow. Effective qualitative research is centered on ethnographic study. Ethnography is simply a fancy term for the study of people, society, and culture. It is used in anthropological research, but we can also apply it to marketing strategy. Ethnography in marketing circles is essentially qualitative research carried out by observing focused groups of people and gathering information. Focus groups help you understand the consumer from all facets, which plays a role in how they make purchasing decisions. Alan G. Lafley—chairman, president, and CEO of Proctor & Gamble from 2000 to 2010 and 2013 to 2015—was a strong proponent of qualitative market research. Using it, he led his company from a disastrous restructuring into a marketing powerhouse. P&G focused too heavily on quantitative research, so to pull itself out of a slump, the company shifted to adopting more qualitative research such as ethnography and used this data to drive its quantitative research. Let’s talk more about focus groups since they are a powerful form of qualitative research, yet they don’t cost a lot of money or resources to execute. Fast and inexpensive – Since you are only talking to a small group, this method tends to be less expensive than other, more detailed market research. 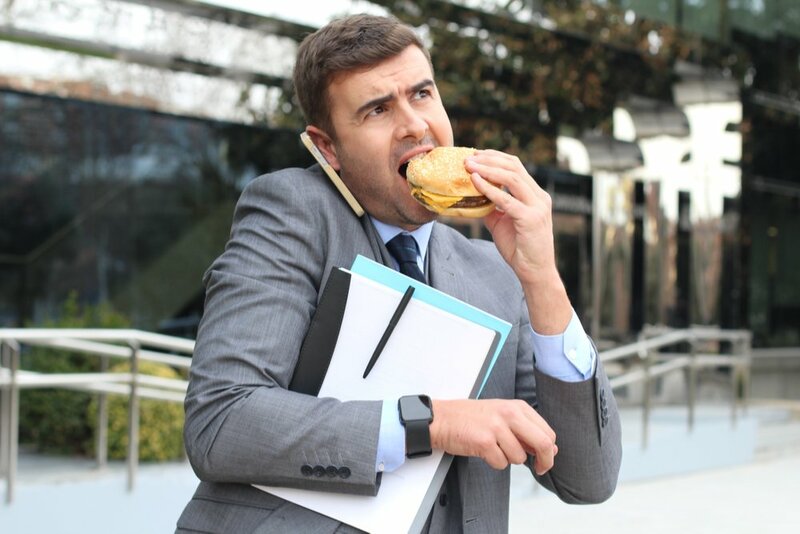 Qualitative – As mentioned before, you are gathering qualitative feedback, which is important to understanding consumer perceptions and decision-making. 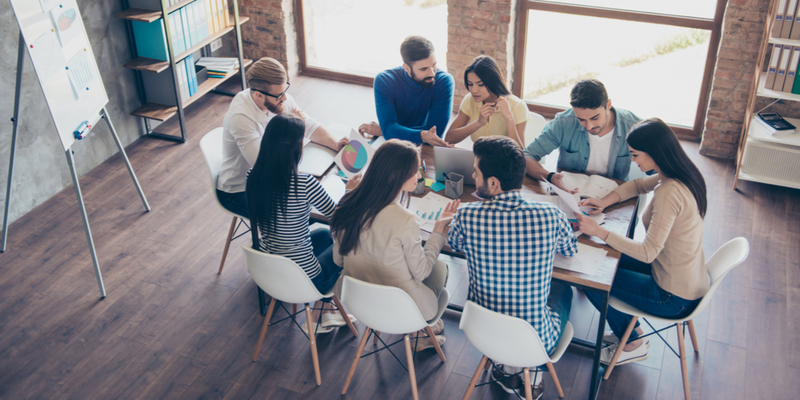 Great for initial learning – Focus groups are also valuable when you want to gather some initial feedback, even before you move forward on a major company decision. Excellent for target profiling – Assembling a focus group will prompt you to get super clear on whom you are targeting since you need to recruit focused participants for your research, the exact people you are targeting with your products. Test your positioning – Market positioning refers to setting the perception in your consumer’s mind of how you want your brand to be perceived. This is key to scaling your business, and focus groups can allow you to test and see how well positioned you are. Proof of concept – Let’s say you are trying to convince senior management to buy in to a product idea. Market research can give you proof to back up your claims. Going to executives with actual customer feedback instead of a suggestion based on hunches can help to seal the deal. Too many segments in one group – Stay focused with your segments. If you want to test multiple segments, create multiple focus groups. Sample size too small – On the flip side, make sure your sample size is big enough to represent a magnitude of feedback. Poor moderating techniques – The focus group moderator should be not only organized but also unbiased and remain impartial for the entire discussion. Uncomfortable setting – Choose a location that is comfortable, informal, and familiar to participants so no other factors impair their opinions. This means no boardrooms or closed-door offices. Have you ever run a focus group before? It can seem intimidating at first to think about running focus groups, especially if you are a small business. But, they aren’t that difficult to run as you only need a small sample of people—as few as 5 people will do the trick, but we recommend at least 8-10. When thinking about who to invite to your focus group, consider your goal. What are you wanting information about? New product feedback? Product improvements? Brand awareness? Consult your target audience personas, and choose a focused selection based on those demographics and your overall goal. For example, let’s say that you sell bikes to kids all the way to adults. If you are validating a new product idea, think about whom you are targeting with this product. Is it females aged 25-40? What are their lifestyle habits? Do they like to ride bikes with their kids? Are they millennials who ride their bikes to work in NYC? Essentially you want to focus on the people who will give you the exact information you are looking for—the people who would purchase your new product. For more information on how to run focus groups, check out this resource. Don’t worry. Quantitative research isn’t that difficult. But you need to do some planning to make sure you set it up correctly. Otherwise, you will waste money and resources. Quantitative research allows you to test and measure data in large numbers. And one of the most effective quantitative research modalities is customer surveys. Customer surveys are effective because they garner feedback from a representative sample of your target market. This simply means that by gathering feedback from this subset of your market, you can make educated assumptions as to what your entire target market thinks, provided you set up your survey sample size correctly. We will discuss this a little later. How do you run customer surveys? Typically, consumer surveys are offered via an online questionnaire or by phone. Which one you choose will depend on your target’s preference. For example, if your target consists of mainly millennials, an online survey may be the way to go. If your customer database consists of mostly phone numbers, a phone call may be more effective. One other point introduced in this 2015 study is that people tend to exercise “social desirability bias” when answering questions over the phone. So participants may not feel as comfortable telling the whole truth via phone as they would with a more “hidden” online survey. So it’s time to build out your customer survey…what are you looking to get out of it? Well, the right data from the right sample size will empower your marketing campaigns. The wrong data from the wrong sample size will be of no use to you. So, in a nutshell, what we are saying here is to pay attention to this section, It could mean the difference between your data being a home run or a time- and money-wasting dud. Demographic data includes lifestyle choices and facts such as age, gender, location, income, etc. Demographic data will tell you who is buying your products and what their lifestyle looks like. Attitudinal data gives you an idea of your consumers’ attitude toward your product and brand. How easy are your products to use? How good is your customer service? These variables and more will play into how your targets perceive your company. Statement: I consider myself a knowledgeable online shopper. Behavioral data measures preference, usage, satisfaction, purchases, and activity. This data will give you an idea of how your customers are buying and what steps they are taking to get there. IMPORTANT: The key to gathering valuable quantitative data is to leverage ALL 3 of these data types and use them in combination. Your survey questions should yield data for each. How many people should you survey? Since you won’t be able to survey EVERY person in the world who fits your target market, by assembling a representative sample, you can get an unbiased indication with this smaller group and make assumptions that reflect your larger target market. So the bigger question here is…how many people reflect an accurate representation of your market? Too few, and your data can nod toward bias. Too many, and your costs rise without any data improvement. This is where sample size comes in. The sample size is the number of people who will participate in your survey. But, it’s not some arbitrary number you pull out of the air. Not a statistician? Don’t worry, there is an easier way. 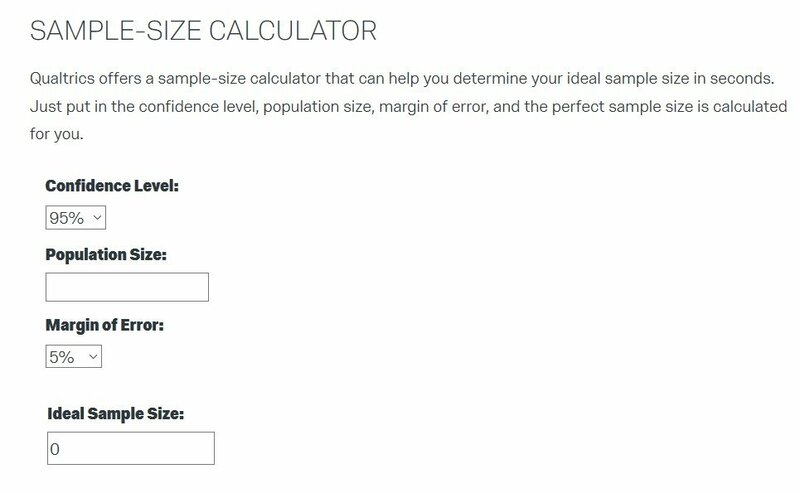 Simply Google “sample size calculator” and you’ll find simple calculators to automatically calculate your sample size with a few inputted variables. Here is an image of a sample size calculator from Qualtrics. Enter the population of the market you want to represent with your survey. For example, if you were running a study on monthly clothing spend among Florida millennials, the population size would be the number of millennial Florida residents who regularly buy clothing on a monthly basis. While in some cases, population size is easier to estimate (number of people in a company-wide study), in some cases, it can be difficult. Do your best to estimate the population size, but if you need some help, researchers suggest using a population size of 20,000 or larger. The confidence interval (or margin of error) is the plus or minus variance that accompanies most survey answers (Ex: +/- 2.5%). It represents the possible margin of error between the sample size answers and that of the entire population (if you had asked them). So, for example, if you select a confidence interval of 3 and 85% of respondents chose one particular answer, you can assume that if you surveyed your entire target population, the answer would be 85% +/- 3%, or 82- 88%. TIP: Keep the confidence interval small if accuracy is critical, meaning it is tied to an important company decision that may involve substantial money loss if the data is not precise. As you lower your confidence interval, you should increase your sample size to maintain precision. How confident are you that your results will be accurate? This is defined by confidence level. Typical survey confidence levels for marketing are 95%, which means that 95% of the time, the results will land within the specified margin of error. Run your survey on your representative sample and then report findings by including your confidence level and interval percentage. For example, let’s say you ran a survey with a 95% confidence level and a confidence interval of 5. Example survey result: 90% of Florida female millennial respondents spend $175 a month on workwear. Your survey findings: We are 95% confident that 85-95% of Florida female millennials spend $175 per month on workwear. As with any research method, there are pros and cons. Surveys are beneficial because they break down the real numbers, give you proportions and magnitudes, and include representative findings. You can also create segments to get super targeted and determine market sizing, which represents the total number of buyers for your product. Surveys can go awry, however, if you don’t pay attention to specific details. First, if your sample size isn’t an accurate representation, then you will waste money and time gathering bad data. Asking the wrong questions or measuring the wrong focus can also be a time and money waster. In some cases, customers may not be able to answer accurately because they do not know what motivates them. This is why asking the right questions is critical. In other cases, the survey may be too long, which can diminish accuracy. Overwhelmed a bit by some of these market research strategies? We get it, and we have a solution. If you are just starting out and this is your first time conducting market research, start with a little secondary research to get used to the concept. This involves finding preexisting data. Search the internet and hang out where your target market gathers and monitor their conversations. Review popular industry blog comments; rummage through Q & A sites such as Quora and Yahoo Answers; and review social media conversations on Reddit, Instagram, Facebook, and Twitter. What are they talking about? Do they have any feedback on your competitors? Do they like or dislike a product? What do they want to see more of in your industry? If you conducted past research, while it may be outdated, glean what you can to inform future research. STEP 1: Start with secondary research so you can get familiar with the market and find out what others already know. This method is fast and free, and it’s ideal for newcomers to market research. The downside of secondary research is that it could be outdated and inaccurate, and the source could be unreliable. You also don’t have control over the sample size. Since you are not controlling the research nor do you know the source, it’s difficult to know what is reliable and current. Having said that, it can still be a good starting point for newcomers. STEP 2: Don’t stay with secondary research too long. The goal is to then move into qualitative research to help you understand the market. Getting a strong feel for the market will help you ask the right questions on your surveys when you move into quantitative research. For example, focus group findings may reveal problem areas to focus survey questions around. STEP 3: With quantitative research, you then test these hypotheses on a larger scale to refine your understanding of the magnitude of the problem and gather some attitudinal and behavioral data. This may seem kind of backward…do qualitative research first to get insights for quantitative research? Why not just run them together or run quantitative research first to get hard data? If you want to be successful, you want to do market research backward. Backward market research is forming conclusions about the research before you even execute it. This doesn’t mean that you predict what the data will tell you. It merely suggests to formulate an idea of what you would like to glean from the research without assuming exactly what the data will look like. The key here is NOT to go in blind. When you receive the data, you should already have an idea of what you are looking at and what charts will be filled out. The idea is to start the initial process by uncovering why you are doing the research and what you are trying to prove with the data and what charts you will need. This will lead you to the right tool/modality to get the job done instead of the tool dictating how you receive and gather the data. It’s backward, but it works. In this article, we’ve covered a lot of ground (whew!). We talked about the different types of research (qualitative and quantitative), what they are, and how to execute each. We also discussed secondary research (good for beginners) and the best ways to approach the market research process so you don’t waste resources. Focus groups are a cost-effective and convenient form of qualitative research. Talk to your consumer in their natural environment. Quantitative research is super powerful, provided you set up the survey correctly and gather an adequate sample size. One form of research is not better than the other. Combine qualitative with quantitative research to execute a well-rounded and powerful market research strategy. Use backward market research by finding out what questions you are trying to answer first and then designing your survey and research around that. If you haven’t read Part 1 of this article series, go there now and come back here again. It’s CRITICAL that you understand why we are doing market research in the first place. It centers on being market oriented, which essentially means that you realize you know nothing about your target, which is why you need to do market research in the first place. The best marketers are those who can admit that though they may have hunches and assumptions about their target market, they are likely dead wrong and can be humble enough to admit it. Market research is the missing link that fills in the gaps in your knowledge, helps you grow much faster, and allows you to satisfy your customers. It’s one of the most important components of constructing a solid, long-term marketing strategy. It’s not hard to do either. Just jump in get started. You will be happy you did.